On August 5 the U.S. Environmental Protection Agency (EPA) released a pre-publication rule proposing stronger standards for commercial and private pesticide applicators who apply restricted-use pesticides (RUPs). The rule will raise the Federal standards for applicator competency, including testing, certification and continuing education, in an effort to provide assurances that certified applicators and noncertified applicators under their direct supervision are competent to use RUPs in a manner that will not cause unreasonable adverse effects. Additional training and certification requirements will be implemented for noncertified applicators working under direct supervision of a certified applicator, including training and/or passage of the core exam. Added responsibilities for certified applicators supervising a noncertified applicator applying RUPs, including being certified in the category of the application being performed by the non-certified applicator, and being available for direct communication, either on site or via cellphone, two-way radio, or other mechanical device. Commercial applicators will be responsible for maintaining training records of non-certified applicators for 2 years. Standardizing requirements for certification exams, including the requirement of a proctor and mandating all exams be closed book, in addition to identification procedures. Instituting standard based recertification requirements for commercial applicators every 3 years, including 6 CEUs for core application and 6 CEUs per specific category. Applicators must earn half of the required CEUs in the 18 months preceding expiration. Under the current Federal Insecticide, Fungicide, and Rodenticide Act (FIFRA) structure, the standards set forth are the minimum requirements a state must implement. In some states many of the above changes are already mandated. EPA specifically noted this fact and has proposed the heightened standards to provide a more unified regulatory scheme under FIFRA. States that are below the proposed minimum standards will be required to raise the minimum standards in their state plans. 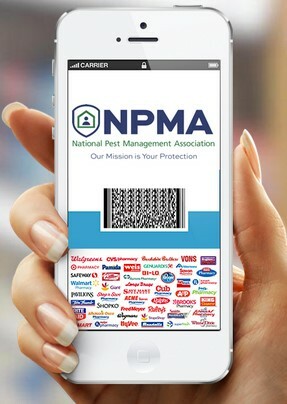 The most important thing for Pest Professionals to note is that even though the above changes to the federal regulations only apply to persons applying restricted use pesticides or persons working under their direct supervision, each of the fifty states will need to alter their certification and training laws and regulations to come into compliance with the federal requirements. In almost every case, the changes to the state laws and regulations will impact the use of general use pesticides by PMPs. The NPMA policy team has already and will continue to meet with officials at EPA, and will be working closely with State Regulatory Officials throughout the nation to analyze impacts and assist in identifying areas of the proposed rule that we feel should be amended. The proposed rule has not officially been published in the federal register to date. When it is officially published there will be a 90 day public comment period. The proposal provides for a delayed implementation if the rule is finalized, up to four years for existing state certification plans. NPMA’s Public Policy Staff will provide a more detailed analysis next week after we’ve had an opportunity to meet with the agency and clarify specific questions. Please contact the NPMA policy team with questions or concerns. 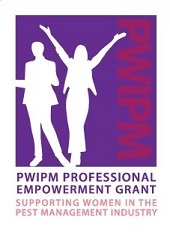 Only 4 Days Left to Submit Nominations for the PWIPM Professional Empowerment Grant! Do you know a female who is interested in advancing or securing a career in pest management? Nominate her today for the PWIPM Professional Empowerment Grant! A minimum of $1,000 will be granted to the recipient to defer costs related to advancing her career or education in the pest management industry. Additionally, up to $500 towards travel expenses to attend NPMA's PestWorld in Nashville, Tennessee, Oct. 20-23, will be provided. Will you be joining us in Nashville for PestWorld 2015? Make your hotel reservations soon – the Gaylord is already sold out for several of the days during the conference. Click here to be placed on the Gaylord waitlist, or click here for information about alternate hotels which offer complimentary shuttle services to the Gaylord. Still need to register for PestWorld? Register before Sept. 4 to take advantage of early bird pricing. 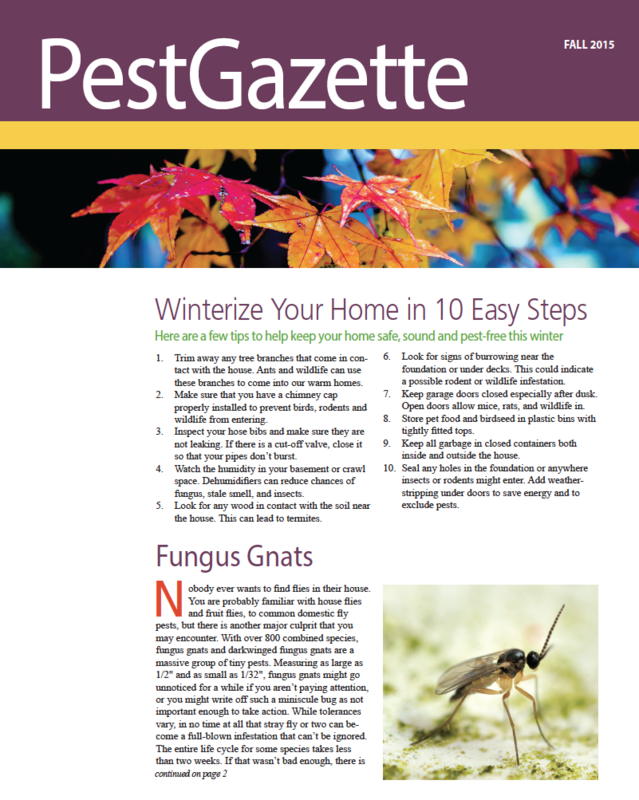 Fall is right around the corner and the Fall issue of Pest Gazette will help you give your customers and prospects a description of the various types of pests that may take over their home and yard during the season. The Pest Gazette is customizable – you can add your logo, your contact information and an article of your choice. Click here to view the current issue. Click here to fill out an order form or contact us at pestgazette@pestworld.org. What Does it Take to Get QualityPro Certified? QualityPro certifies companies that have met the industry standards for professionalism. After application, a company has 6 months to earn certification by meeting the standards. Haven’t met all the standards yet? No problem! Apply today and QualityPro will help you through the process. At application, you’ll gain access to the templates and resources that can help make your company QualityPro: www.npmaQualityPro.org. Dr. Mary L. Cornelius, of the USDA Invasive Insect Biocontrol and Behavior Laboratory in Beltsville, MD, led a research team that investigated how a variety of external factors affected colony dynamics of the Formosan subterranean termites (Coptotermes formosanus). This combined 1 and 5 year study involved regular collection of Formosan termites from subterranean monitoring stations in New Orleans and compared the relative distribution of workers, soldiers, and nymphs (pre-reproductives) throughout the duration. Feeding damage, precipitation, temperature, and soil composition were all measured and compared against shifts in the castes present in monitoring stations. The level of feeding on the spruce in the monitoring stations affected how many termites were recruited to the monitoring station and how likely they were to remain there and feed. In some cases, the workers consumed nearly all the wood provided and primarily soldiers were left behind. This suggests that that at high foraging levels, bait might be completely consumed by Formosan termites and the station quickly abandoned. 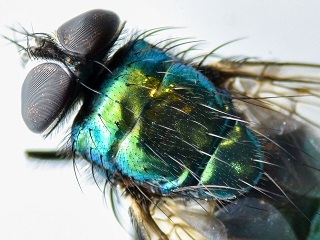 This paper was published in the most recent volume of the Journal of Insect Science under the title, “Seasonal changes in the caste distribution of foraging populations of Formosan subterranean termite in New Orleans, Louisiana." This week, NPMA’s Policy Team sent an alert out to members requesting they submit a letter to the Department of Labor (DOL) requesting a 60 day extension of the comment period on the DOL’s proposed overtime rule. If granted, the comment period would be extended to November 3, 2015 and give our industry more time to conduct necessary research. As of this morning 185 letters have been submitted by NPMA members! We are fighting an uphill battle an every voice counts. If you have not already done so, please click the below link to submit an extension request to DOL. Click here to take action and submit an extension request to DOL! NPMA was one of several associations to request a 60 day extension as part of the Partnership to Protect Workplace Opportunity (PPWO). The PPWO is comprised of a wide range of associations and companies that represent a diverse group of industries and interests. Additional talking points, information and grassroots assistance will be provided in the coming weeks and months. On Wednesday, August 5 S. 1500 Sensible Environmental Protection Act passed the Senate Environment and Public Works (EPW) Committee. S. 1500 would clarify that federal law does not require the redundant and unfairly burdensome NPDES permits for already regulated pesticide applications. It is NPMA’s position that FIFRA approved products require no additional restrictions or additional regulatory burdens due to FIFRA’s statutory authority and the detailed pesticide approval process. S. 1500 should be brought to the full Senate sometime this fall, while the House has already passed similar legislation. At this point it is unclear whether the President would veto this legislation if it was brought to his desk for final passage. On Tuesday, August 4, NPMA sent an action alert to members that live within states of Senators that sit on the EPW Committee. The NPMA policy team would like to thank those members that participated and sent letters to their Senator, and highlight the positive impact those letters had in passage of S. 1500. Click here to read the letter submitted by NPMA members to their respective Senators. Florida Announces their 2015-16 Operation Clean Sweep program for disposing cancelled, suspended and unusable pesticides. Click here for more information. On Thursday, July 30 NPMA submitted a request for a 60-day extension of the comment period on the Department of Labor’s proposed Overtime rule. If granted, the comment period would be extended to November 3, 2015 and give our industry more time to conduct necessary research. A JDI Electric employee has died after a crew was attacked by a swarm of bees in Riverside. There were two different construction projects underway at the Wal-Mart parking lot. The hive was located in an underground sprinkler box on the south end of one construction site. If You Were Stripped of Your Title, Would People Still Follow You? Arrow Exterminators recently held the company’s annual Fiscal Year Kickoff meeting at the Georgia Tech Conference Center in Atlanta, Georgia. Pi Chi Omega is pleased to announce that as of Aug. 1, 2015, the organization will be managed by Cooper Coron & Associates (CCA). Reynolds Pest Management, Inc. is proud to announce the promotion of Eric Carter to Inspections and Sales Manager of the South Florida division. Arrow Environmental Services has merged with Orlando-based 4 All Seasons Pest Control Inc.